I have always been pretty good with conformational faults and spotting unsoundnesses in horses thanks to my past 4-H and horse bowl experiences. This semester I am taking a Equine Biomechanics and Conformation class and I was excited to realize that I didn’t know as much as I thought I did. Sure I can tell you if your horse is camped under behind, over in the knee, or croup high, but I wasn’t able to look at a horse and figure out their overall balance. Ideal – The length of the horse from the point of the shoulder to the buttock should be equal to the height of the horse from from the top of the withers to the ground. This should create an box around the horse (minus the head and neck) that is a square with equal sides. Ax – The length from his shoulder to buttock is longer than the length from his withers to the ground. AKA he is longer than he is tall by about three or four inches. Also to note, his point of shoulder is not aligned with his point of buttock so he may be considered even longer. That causes the box to be slightly shorter on the vertical sides. Measure the length (horizontal blue line) and rotate the line to compare it to the height (vertical blue line). Copy those lines and place them on the ends of the length and height lines to create the box (red). 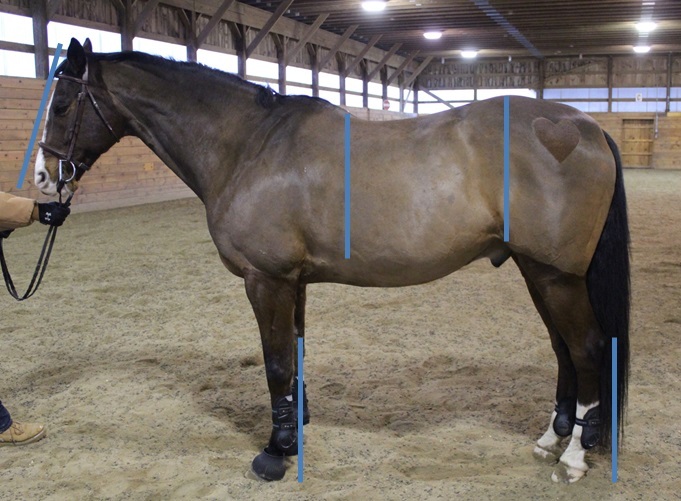 Ideal – The depth of the heartgirth from the top of the withers to the elbow should be equal to the length of the leg from the elbow to the fetlock. Ax – The lengths are exactly the same. Yay. 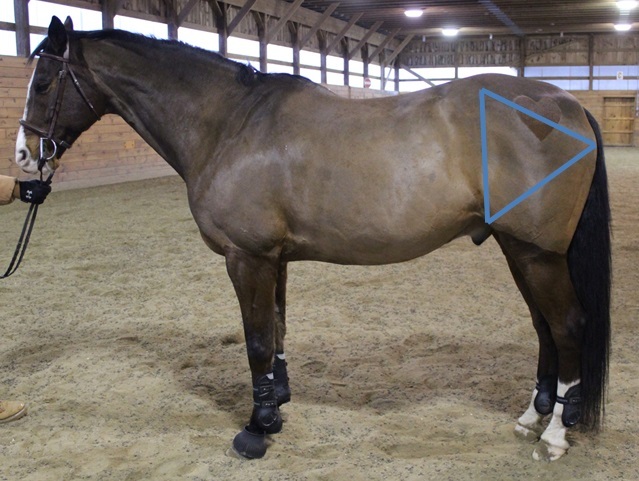 Measure the length of the elbow to the fetlock, copy the line, and compare it to the length of the withers to the bottom of the hearthgirth. Ideal – The topline should be level so the point of the croup is at the same height or slightly lower than the top of the withers. 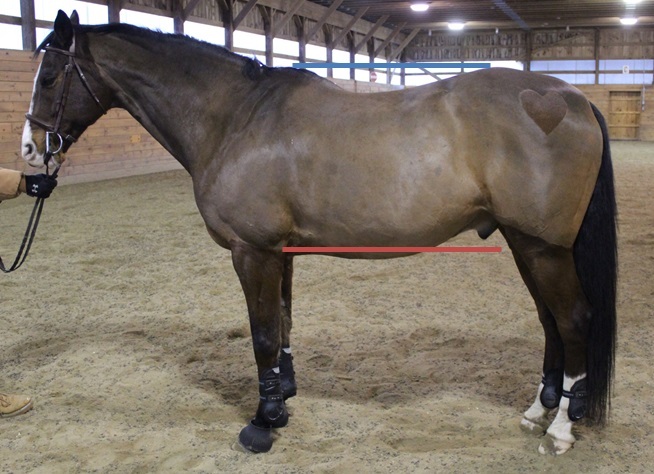 The topline from the top of the withers to the point of the hip should be shorter that the underline from the point of the elbow to the stifle. Ax – His topline is perfectly even and the length of his topline is indeed shorter than the length of his underline. Measure the topline (blue line), measure the underline (red line), and place them beside each other to see the difference in length. Ideal – The forequarter of the horse (minus the head and neck) should be equal to the hindquarter of the horse when a line is drawn through the center (near the last rib) of the horse in the box from before. Ax – This one is tougher to measure, but I think that he is pretty even. 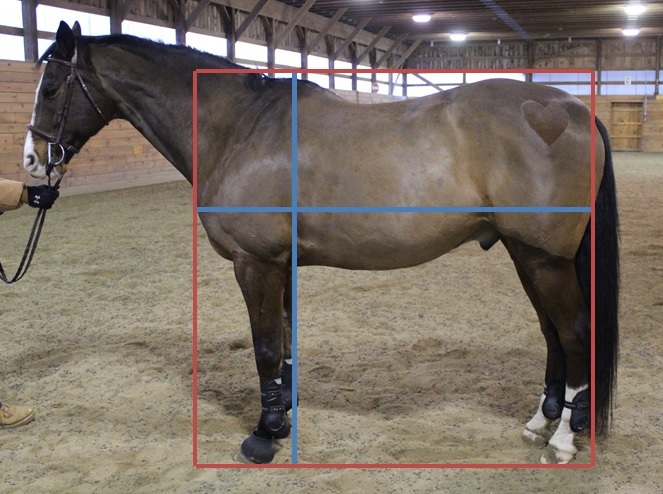 Using the box from the first step (red box), draw a line through the center of the horse (blue) and measure the distance on either side. Ideal – The shoulder, back, and buttock should all be equal in length when lines are drawn from the top of the wither to the ground and the point of the hip to the ground in the box from before. Ax – His back is very slightly longer than his buttock and both are longer than his shoulder. Using the box from before (red box), draw a line from the top of the withers to the ground and the point of hip to the ground (blue lines). 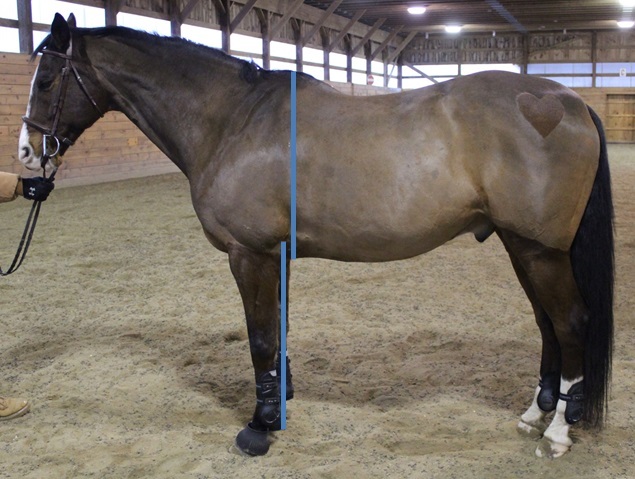 Ideal – The length of the head should be similar to the lengths from the point of the hock to the ground, the chestnut on a forelimb to the ground, length of heartgirth, and from the stifle to the croup. Ax – The length of his head is equal to the length of his hock to the ground, his chestnut to the ground, and his stifle to his croup. It is much shorter than the length of his heart girth. He has always had an infamously tiny (but cute) head, but maybe he just has a strangely long heartgirth instead. Draw a line along the length of the head and copy it to compare to the lengths of the other body parts. Ideal – The lengths from the buttock to the stifle, the stifle to the point of the hip, and the point of hip to the buttock should all be similar. Ax – None of the lengths are equal. His hip to stifle is the longest and his buttock to hip is slightly longer than his buttock to stifle. How does your horse compare to the ideal horse? TOA Blog Hop 8: Worth 1k Words. 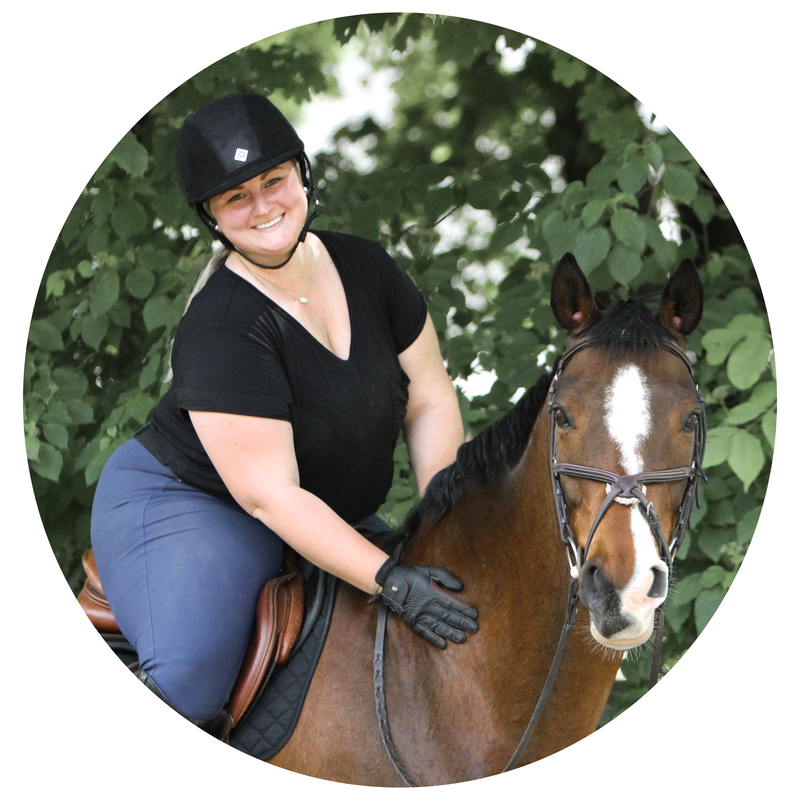 The overall balance of a horse is so important – a lot of people don’t realize that a horse’s personal conformation really “decides” what they can and can’t do! Very interesting – I know in my old 4-H manual it shows a variation of your examples, although it is more of illustrations/drawings than “real life” photos. I had mostly seen the diagrams on drawn or painted breed standard horses, or horses that that had extreme conformation. None of a normal horse. I found it interesting comparing the two. Not at all! I look forward to reading it! very cool! now i want to try this too! i know very little about conformation and have a terrible eye for it… but this makes it appear very accessible, so thanks! Great work! I too am a 4-H “horse judging” alum. I remember the time they brought in a group of draft horses at a state competition. We didn’t know what to make of them. Thank you! We did a group of minis at one of ours and I just judged them on cuteness. Interesting! A few of the measurements I’d heard of from my 4-H Horse Judging days, but most of them I didn’t. Thanks for sharing! Thank you for posting this! I will be doing this to Prisoner soon! Welcome! Make sure to share the link with me if you do! I wish I could do a post on this but I have zero clue how you drew all those lines haha. Super informative! I pasted the photo into a Word Document and used the line tool in “symbols” to draw them on then screen shot the whole thing into Paint and saved it as a photo. There is probably a MUCH easier way to do it. I am really glad that Carly pointed us to your post! You will now have a new follower. Very cool! I do too, aside from the levelness of the withers and any huge discrepancies. Welcome! Make sure to share the link with me if you do! I love seeing how everyone is checking out their horses. Great post! You inspired me to critique my horse! This is a great post! Sadly, I don’t know much about confirmation, so this was extremely educational! Thanks for posting!